There are lots of things going on in the world of work and organizations I could rant about, but right now I’m shocked and saddened about the very sudden passing of my friend and fellow adult skater Audrey Clearie. I met Audrey through skating, and being a skater was incredibly important to her. When she visited the hospital emergency room less than a month ago (a visit which turned out to be the first step in her diagnosis of liver cancer) she had just returned from the annual International Skating Union adult skating competition in Germany. A few weeks before that, she had been at the Canadian national adult skating championships. She didn’t compete at either event – she just went to hang out with the other adult skaters, cheer them on, and have fun. That’s how much she loved skating. I first got to know Audrey when her daughter Erin and I skated on the same training session. Being a curious and friendly person, she started talking to me, as the only adult on that session, about how long I had been skating, if I liked being on the ice with the younger skaters, and so on. I learned that she was a nurse, and that she was enrolled in a distance education program through the University of Victoria to complete her bachelor’s degree in nursing. From my own experiences teaching mid-career adult students, I knew the commitment it took to embark on that path, and the tremendous amount of work that was involved in studying for a degree while working and raising a family. So when she graduated, I was incredibly proud of her, as we all were. When my skating club started a session for adults, Audrey joined up, and learned how to skate herself. One thing I have seen over and over again in adult skating is how transformative it can be. By that, I mean that through participating in skating – especially in the supportive company of other adult skaters and coaches – people realize that they are more than a spouse, a parent, an employee, or some other life role. And that realization can lead to some profound changes. Audrey is one of the people that I have seen most strongly transformed by skating, and while some of the changes were very difficult, she was brave and persistent, and eventually got to where she wanted to be. 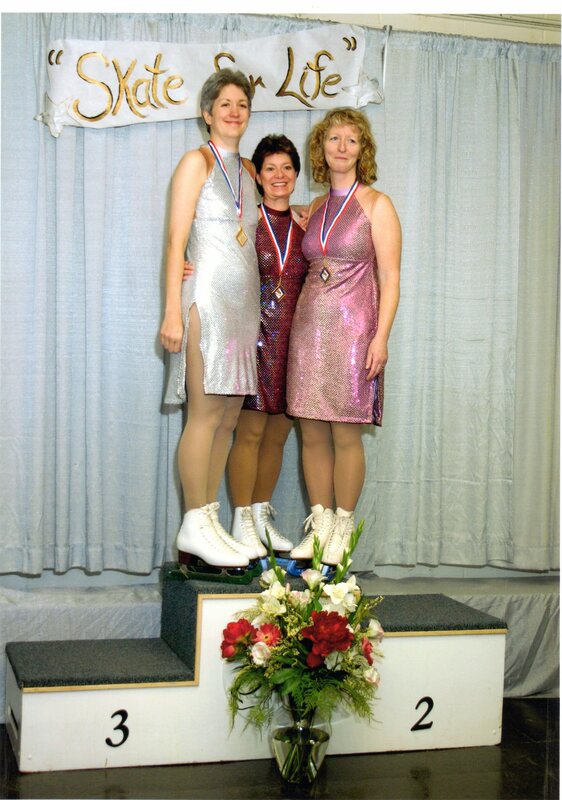 Me, Barb, and Audrey at the 2004 British Columbia-Yukon Adult Open skating competition. When I think of Audrey, I also think about her first skating competition, which was in Kamloops in 2004. She was persuaded to join a three-person team, with me and our friend Barb, to enter the team elements event. In this event, each skater on the team performs a different element, such as a spiral or a spin, and the team’s score is the total of each individual skater’s score for their element. We all practiced a lot in the weeks before the competition, but I could tell that Audrey was really nervous about the whole thing and wasn’t too sure if it was a good idea. Then just before we were to leave for the competition, Barb’s mother-in-law, who was fighting breast cancer, became very ill and was taken to hospital. Audrey and I told Barb that we would withdraw from the competition if she wanted to stay with her family, and she said that her mother-in-law wanted us to go. That made the competition extra important to us, so we all put out our best effort, and our team won a gold medal. When we got home, Barb was able to take her gold medal to the hospital to show to her mother-in-law before she passed away. The photo in this post is from that competition, and it’s one of my favourite photos from my entire adult skating career. I also never failed to be amazed by Audrey’s incredible musical ear. After a few times playing music bingo with her at the pub, I saw that she could identify nearly any song after hearing just the first few notes – and I learned never to compete against her in games like music bingo, because she would always win. One year, the music I used for my interpretive skating program was Lloyd Cole’s song Baby, from his album Love Story, and Audrey loved the song so much that I burnt a CD of the entire album for her. (Lloyd, if you read this, sorry, but it was out of print!) After Audrey had listened to it, she said to me, “Those songs are excellent. There’s a little country in them, a little jazz, a little bit of everything.” Love Story is one of the albums that I would take to a desert island, and at that point I had listened to it about a gazillion times, but after Audrey and I had that conversation, I went back and listened to it again. And she was right – I heard things in those songs that I had never heard before. That is how musical she was. All the adult skaters that knew Audrey – and who experienced the joy of her generous spirit, her sense of humour, and her kind heart – will miss her terribly. And I will miss not only my fellow skater, but also my friend. ← Is Peer Review Truly Unbiased? What a wonderful memory to our friend. I never thought that taking my skates in to be sharpened one day would lead me to adult skating , so many doors opened and so Many friends found ……..
Ditto to what Victoria said. I am at a loss for words which is not common for me. What a beautiful post! I am sorry though.. Your words are beautiful! What an amazing tributre – you truly captured what Audrey was to many of us & filled in a lot of details that we never knew. She is so special and will continue to be a role model for all of us … young and “mature”. Thank you for sharing!